Directive 97/78/EC provides for veterinary checks on consignments of certain products of animal origin introduced into the Community from third countries. 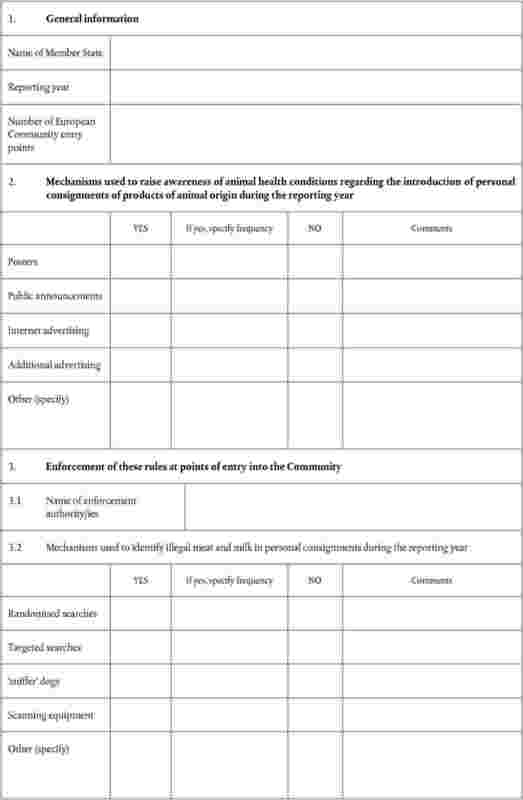 Pursuant to Article 3(1) and (2) of that Directive, Member States are to ensure that no consignment from a third country is introduced into the Community without having been subjected to the appropriate veterinary checks (systematic checks), and that consignments are introduced into the Community via a border inspection post. Pursuant to Article 16 of Directive 97/78/EC, those requirements are not to apply to products which form part of travellers' luggage and are intended for their personal consumption, in so far as their quantity does not exceed a quantity to be defined in accordance with the procedure described therein. Also, those requirements are not to apply to products sent as small consignments to private persons, provided that the products are not being imported by way of trade, in so far as their quantity does not exceed a quantity to be defined in accordance with the procedure described in that Directive. Commission Decision 2007/275/EC of 17 April 2007 concerning lists of animals and products to be subject to controls at border inspection posts under Council Directives 91/496/EEC and 97/78/EC (4) lists the products of animal origin to be subjected to veterinary checks at border inspection posts. Article 8 of Commission Regulation (EC) No 136/2004 laying down procedures for veterinary checks at Community border inspection posts on products imported from third countries (5) lays down a weight limit of 1 kg for the exemption from systematic veterinary checks for products destined for human consumption from approved countries or parts thereof. That Article also lays down weight limits for other specific products of animal origin introduced into Denmark, inter alia, from Greenland and the Faeroe Islands, and with regard to certain fish introduced into Finland and Sweden from Russia. Annex II to Decision 2007/275/EC lists the composite products which are exempted from veterinary controls. Those products should therefore also be exempted from the systematic veterinary controls when they form part of travellers' luggage and are intended for their personal consumption or when they are sent as small consignments to private persons. The requirements and in particular the weight limits for the introduction of consignments of products of animal origin for personal consumption are therefore laid down in several legislative texts. Those requirements, however, need to be easily understood by enforcement authorities, travellers and the general public. It is therefore appropriate to simplify and to bring together in one Regulation, the types and quantities of products of animal origin for which an exemption from the veterinary checks laid down for commercial imports may be granted. The possible risk of introducing animal diseases into the Community through the introduction of products of animal origin should always be considered when laying down measures regulating such introductions. The level of animal health risk varies according to different factors, such as the type of product, the animal species from which the products are obtained, and the likelihood of the pathogenic agent being present. One of the most dangerous diseases that could be potentially introduced into the Community is foot and mouth disease (FMD). The European Food Safety Authority (EFSA) has evaluated the risk of introduction of FMD into the Community. That evaluation clearly shows that the introduction of meat and meat products and of milk and milk products are potential ways for the FMD virus to enter into the Community. In order to avoid the introduction of such diseases, the Community has put in place, for many years, a complete set of rules regulating the imports of live animals and products of animal origin for commercial purposes. 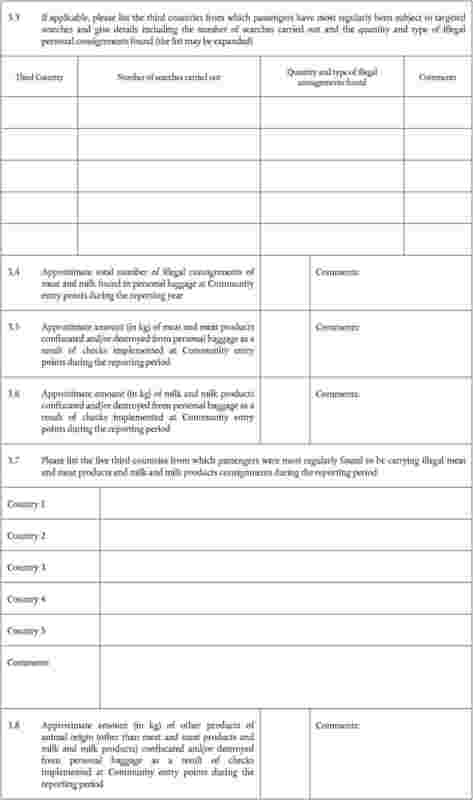 Commission Regulation (EC) No 745/2004 (6) lays down measures with regard to imports of meat and meat products and of milk and milk products for personal consumption. Pursuant to that Regulation meat and meat products and milk and milk products cannot be introduced into the Community by travellers unless such products fully comply with the Community's commercial import rules. That principle should be maintained in the future in order to ensure that the Community maintains its FMD-free status. 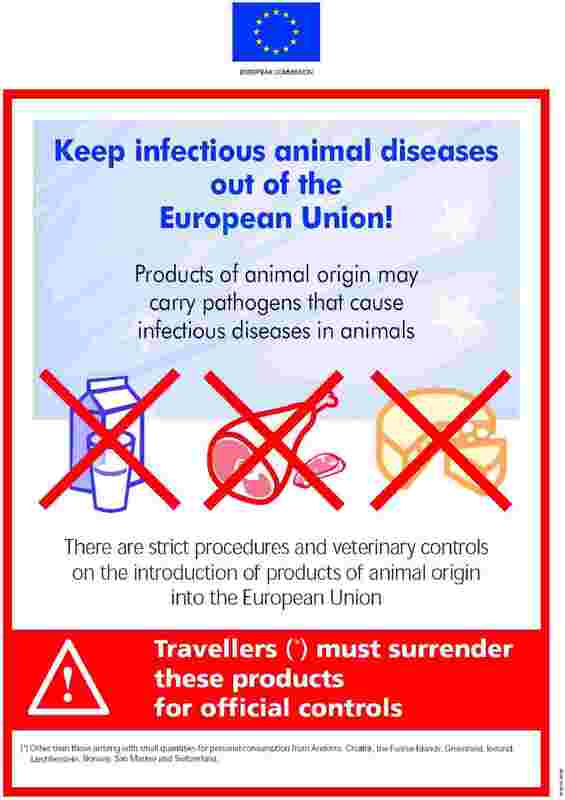 The quantity of meat and meat products and milk and milk products carried by passengers that should be exempted from the systematic veterinary checks at borders provided for by Directive 97/78/EC should thus be fixed at zero. The measures provided for in this Regulation should be without prejudice to Community veterinary legislation having as objective the control and eradication of animal diseases, or concerning certain protection measures. The measures provided for in this Regulation should be without prejudice to legislation implementing Council Regulation (EC) No 338/97 on the protection of species of wild fauna and flora by regulating trade therein (7). It is also appropriate to ensure that information about the veterinary controls and the rules applicable to the introduction of products of animal origin be provided to travellers and the general public. Certain third countries, because of their geographical proximity and animal health status, are considered to present a minimal animal health risk to the Community. Limited quantities of meat and meat products and milk and milk products from such countries should therefore continue to be exempted from systematic veterinary checks. In addition, certain neighbouring third countries have specific agreements with the Community with respect to relevant aspects of the Community veterinary legislation. Annex 11 to the Agreement between the European Community and the Swiss Confederation on trade in agricultural products (8) has been amended as regards trade in agricultural products. As a consequence of those amendments, veterinary checks on relevant consignments coming from Switzerland ceased from 1 January 2009. Pursuant to Council Decision 2007/658/EC concerning the conclusion of an additional Agreement between the European Community, the Swiss Confederation and the Principality of Liechtenstein extending to the Principality of Liechtenstein the Agreement between the European Community and the Swiss Confederation on trade in agricultural products (9), veterinary checks on relevant consignments coming from Liechtenstein also ceased from 1 January 2009. 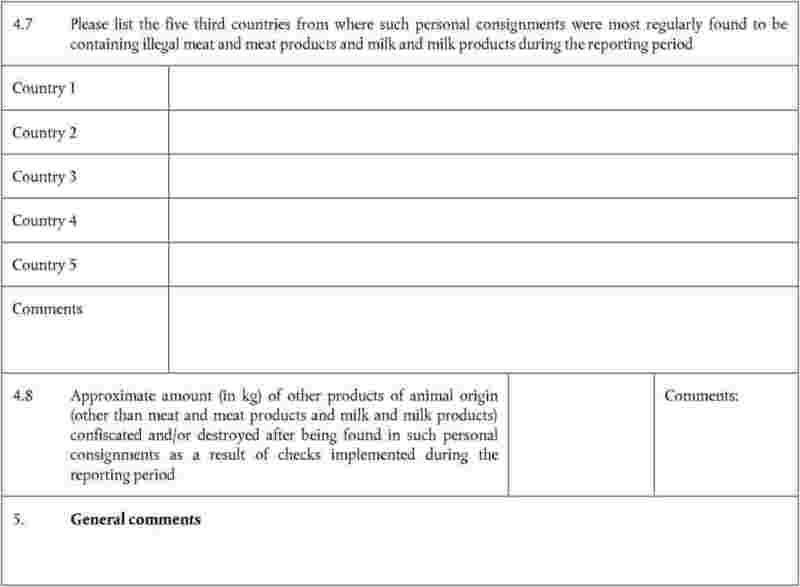 Personal consignments of products of animal origin in quantities below a certain threshold from those third countries with specific agreements with the Community, including Andorra, Liechtenstein, Norway, San Marino, and Switzerland, should therefore remain outside the scope of the systematic veterinary checks provided for by Directive 97/78/EC. To ensure that accurate information is conveyed to passengers, such third countries should be indicated as exempted countries on all relevant publicity material. In general, the animal health status of Croatia may be considered to present a minimal animal health risk to the Community. Products of animal origin in quantities below a certain threshold which are part of passengers' luggage or sent as small consignments to consumers from Croatia should remain outside the scope of the systematic veterinary checks provided by Directive 97/78/EC. To ensure that accurate information is conveyed to passengers, Croatia should be indicated as an exempted country on all relevant publicity material laid down by this Regulation. Due to the current classical swine fever situation in Croatia, however, pig meat and pig meat products could pose a possible animal health risk to the EU. To address this issue, Croatia has agreed to take appropriate measures to ensure that such products destined for the Community and carried by travellers or sent by post to private individuals do not leave their territory, in the case of an outbreak of classical swine fever. In addition, it should be clarified that provisions which apply to certain products of animal origin intended for human consumption should also apply to products of animal origin destined for the feeding of pets, in order to prevent travellers or consumers from circumventing the rules laid down in this Regulation. 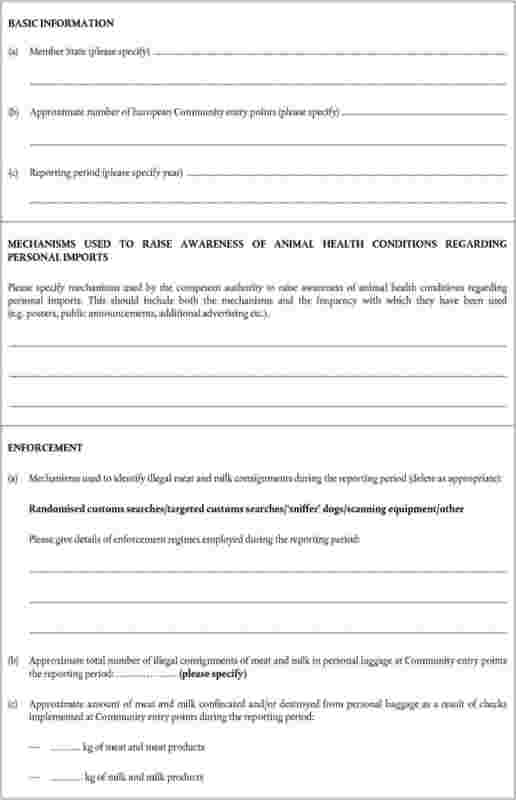 There should continue to be a clear disincentive to prevent the introduction of consignments of products of animal origin of a non-commercial character that are not in conformity with the Community health requirements from entering the Community without undergoing the required veterinary clearance. Member States should impose such costs and penalties as necessary, including the costs of disposal of the products, on persons held liable for a breach of the rules on the introduction into the Community of products of animal origin. Member States should continue to supply appropriate information to the Commission on the mechanisms they have put in place for the enforcement of the rules set out in this Regulation. In addition, the information supplied could then be used to review the rules set out in this Regulation. To ensure that information about the requirements concerning the introduction into the Community of products of animal origin is effectively conveyed to travellers and to the general public, Member States and international passenger transport operators should bring those requirements to the attention of the general public and passengers carried into the Community. In view of the difficulties in collating the information concerning postal depots, more time should be given to the Member States to submit this information. In the interest of consistency and clarity of Community legislation, it is appropriate to amend Article 8 of Regulation (EC) No 136/2004 and to repeal Regulation (EC) No 745/2004. 1. This Regulation lays down rules concerning the introduction into the Community of personal consignments of products of animal origin of a non commercial character which form part of travellers' luggage, or are sent as small consignments to private persons, or are ordered remotely (for example, by mail, by telephone or via the Internet) and delivered to the consumer. 2. This Regulation shall not apply to personal consignments from Andorra, Liechtenstein, Norway, San Marino, and Switzerland. In addition, this Regulation shall not apply to personal consignments of fishery products from the Faeroe Islands and Iceland. To ensure that accurate information is conveyed to passengers, such third countries shall be indicated as exempted countries on all relevant publicity material. 3. This Regulation shall apply without prejudice to Community veterinary legislation having as its objective the control and eradication of animal diseases, or concerning certain protection measures. 4. This Regulation shall apply without prejudice to the relevant rules on certification contained within legislation implementing Regulation (EC) No 338/97 on the protection of species of wild fauna and flora by regulating trade therein. products other than those referred to in paragraphs (a), (b), (c) or in Article 6(1) of Decision 2007/275/EC and their combined quantity does not exceed the weight limit of 2 kg. products listed in Part 2 of Annex II and their combined quantity does not exceed the weight limit of 2 kg. products not referred to in paragraphs 1(c), 3(a), 3(b) of this Article or in Article 6(1) of Decision 2007/275/EC and their combined quantity does not exceed the weight limit of 10 kg. 1. Member States shall ensure that at all points of entry into the Community, the veterinary conditions applicable to personal consignments introduced into the Community are brought to the attention of travellers arriving from third countries. 2. The information provided to travellers pursuant to paragraph 1 shall include at least the information in one of the posters set out in Annex III displayed by prominent notices placed in easily visible locations. information appropriate to the local conditions, and with their national provisions adopted pursuant to Directive 97/78/EC. a second language considered appropriate by the competent authority; that second language may be the language used in the neighbouring country or, in the case of airports and ports, the language which is the most likely used by passengers arriving thereto. Member States shall ensure that the general public is made aware of the requirements concerning the introduction into the Community of products of animal origin which are sent as small consignments to private persons or are ordered remotely by final consumers. International passenger transport operators, including airport and port operators and travel agencies, as well as postal services shall draw the attention of their customers to the rules laid down in this Regulation, in particular by providing the information set out in Annexes III and IV, as foreseen in Article 3. 1. The competent authority or authorities, and those which carry out official controls, in cooperation with port and airport operators and with operators responsible for other points of entry for personal consignments of products of animal origin, shall organise effective controls at points of entry into the Community. 2. The controls provided for in paragraph 1 shall aim at detecting the presence of personal consignments of products of animal origin and at verifying that the conditions laid down in Article 2 are met. 3. The controls provided for in paragraph 1 may be organised using a risk based approach, including, if judged necessary by the competent authority of the Member State, the use of effective detection aids, such as scanning equipment and detector dogs, to screen large volumes of personal baggage for the presence of personal consignments of products of animal origin. seize and destroy such consignments in accordance with national legislation. 2. The competent authority or authorities, which carry out official controls, may impose costs or penalties for the person responsible for any personal consignment that is found to be in breach of the rules laid down in this Regulation. 3. Member States shall ensure that the national legislation applicable for the seizure and destruction of personal consignments identifies the natural or legal person liable for the costs of destruction of all such personal consignments that are seized. 1. Member States shall submit to the Commission, every year, a report summarising the relevant information on the measures taken to advertise and enforce the rules laid down in this Regulation, and on the results thereof. 2. The report shall be in the form of a completed table as set out in Annex V, and shall be submitted by the first day of May in the year immediately following the end of each annual reporting period. The reporting period shall run from 1 January to 31 December. Products of animal origin which form part of travellers' luggage or are sent as small consignments to private persons shall comply with the requirements laid down in Commission Regulation (EC) No 206/2009 (10). 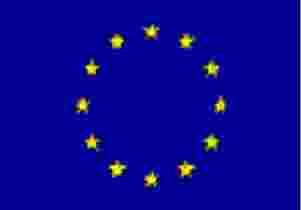 Regulation (EC) No 745/2004 is repealed. References to the repealed Regulation shall be construed as references to this Regulation and shall be correlated in accordance with the table set out in Annex VII. Member States may submit to the Commission, a completed table as laid down in Annex VI instead of Annex V as required in Article 7, for the reporting periods prior to 1 January 2011, by the first day of March in the year immediately following the end of each annual reporting period. The reporting period shall run from 1 January to 31 December. This Regulation shall apply from 1 May 2009. Done at Brussels, 5 March 2009. (2) OJ L 18, 23.1.2003, p. 11. (3) OJ L 165, 30.4.2004, p. 1; corrected by OJ L 191, 28.5.2004, p. 1. (4) OJ L 116, 4.5.2007, p. 9. (5) OJ L 21, 28.1.2004, p. 11. (6) OJ L 122, 26.4.2004, p. 1. (7) OJ L 61, 3.3.1997, p. 1. (8) OJ L 114, 30.4.2002, p. 132. (9) OJ L 270, 13.10.2007, p. 5. Column 1: Where only certain products under any code are required to be examined under veterinary checks and no specific subdivision under this code exists in the goods nomenclature, the code is marked ‘ex’ (e.g. ex 1901: only those preparations containing meat and or milk should be included). Column 2: The description of the goods is as laid down in the description column of Annex I to Regulation (EEC) No 2658/87. For further explanation of the exact coverage of the Common Customs Tariff please refer to the latest amendment to that Annex. Column 3: This column gives details of the products covered. that the packaging is unbroken unless in current use. (The notices can be found at: http://ec.europa.eu/food/fs/ah_pcad/ah_pcad_importposters_en.html). Keep infectious animal diseases out of the EU! Due to the risk of introducing diseases into the European Union (EU), there are strict procedures for the introduction of certain animal products into the EU. These procedures do not apply to the movements of animal products between the 27 Member States of the EU, or for animal products coming from Andorra, Liechtenstein, Norway, San Marino, and Switzerland. 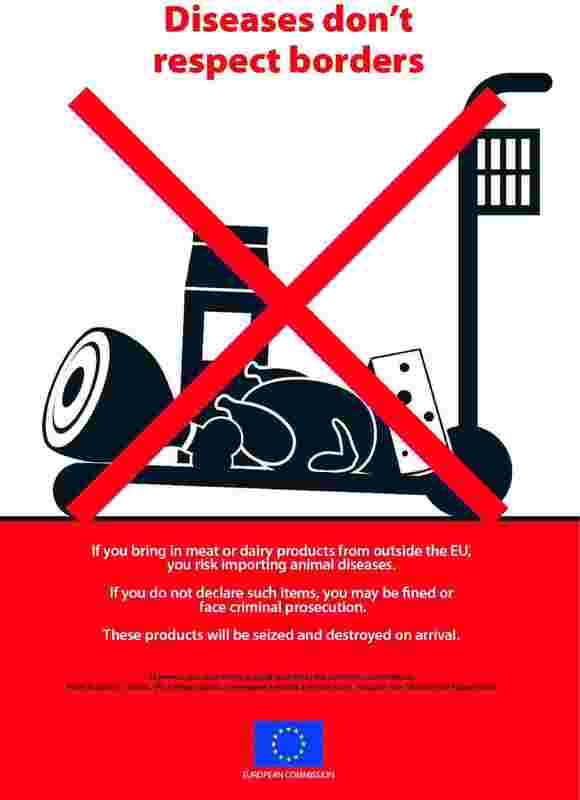 All animal products not conforming to these rules must be surrendered on arrival in the EU for official disposal. Failure to declare such items may result in a fine or criminal prosecution. 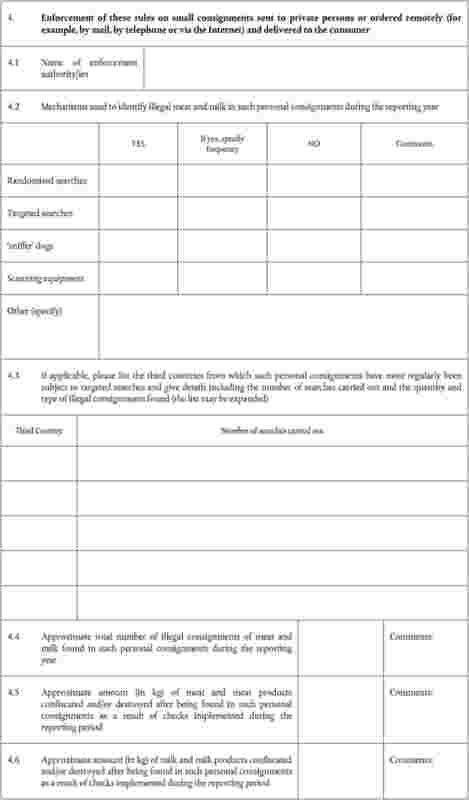 You may only bring in or send to the EU personal consignments of meat and milk and their products (other than powdered infant milk, infant food, and special foods or special pet feed required for medical reasons) provided that they come from Croatia, the Faeroe Islands, Greenland, or Iceland, and their weight does not exceed 10 kg per person. they come from other countries (other than Croatia, the Faeroe Islands, Greenland, or Iceland) and their combined weight does not exceed 2 kg per person. For certain protected species there may be additional restrictions in place. For example for caviar of sturgeon species, the weight limit is a maximum of 125 g per person. To be submitted to the European Commission not later than the first day of May in the year immediately following the end of each annual reporting period. The reporting period shall run from 1 January to 31 December. To be submitted to the European Commission not later than the first day of March in the year immediately following the end of each annual reporting period.